How has it been a month since Battle for Azeroth launched? Holy moly time passes quickly. I suppose a bit part of that is about how completely flat out I’ve been in game. Which leads me in to the topic of this post, and the last Blog Challenge topic (I know I’m late!!) How do you level in Battle for Azeroth? After raiding, levelling is one of my favourite things to do in game. Seeing new worlds, new NPCs, new secrets and adventures really tickles the explorer in me (and the screenshot nerd!) I love taking my time to follow random paths, hunting down treasures, killing rares, seeing new things and helping out a whole new bunch of people. And this is where we start facing some issues – the time I take to level is not conducive to being raid ready. Being in a raid team (especially a team that wants to work on mythic bosses) means there are certain expectations. Characters are required to meet a number of requirements in time for going in to raid to make sure we are able to beat dps checks and heal all the damage going out. For our raid team, we expected everyone to have an ilvl of 340 and Azerite neck at 18 before stepping in to Uldir for the first time. (Keep in mind, 340 is the ilvl that drops from mythic 0 dungeons). I am all for making sure that I’m raid ready. But I’m also not going to sacrifice what I think is important to me about the game. I’m in WoW to have a good time, and new expansions are a really special time for me. So I had to find a happy medium. This is what I did. 1. I levelled alone. Our guild had a few groups of people who were levelling together to help speed up the process. They were also generally in War Mode, which meant they could all help each other stay alive in pvp situations. I didn’t do this for a few reasons, the most important being that I hate feeling beholden to a group. I want to go *my* way, and read all the quest text and stay for all the dialogue and take a million screen shots and visit all the new NPCs in the cities. I want to be able to travel down those random paths and explore every corner of the caves. I also don’t want to hold up a group by doing all those things. I don’t expect anyone else to want to do this (and to be brutally honest, I prefer doing these things on my own). So solo it was. Levelling solo takes longer, simply because there’s only one of you to kill all the mobs and collect all the things. But I accepted this and knew it would be the case. Which is one of the reasons I took a week of work for the launch. It meant that, even though I would take a lot longer to level up, I’d still have plenty of time to do all the things I needed to make sure I could step in to raid in a strong position. 2. I started in War Mode… but turned it off when I got killed the first time. (For those who don’t know – War Mode turns on world pvp, meaning people can come along and kill you out in the world. It’s not able to be turned on or off no matter what server you’re on, which is pretty awesome!!) The experience gains were too good to ignore, so I tolerated it for awhile. I ended up getting killed in Boralus, though, which made me super mad because that was my home turf! So turned it off shortly after. I managed to make it to about 118 before I turned War Mode off. Regular readers will know that I am terrible pvp, so it’s no surprise I did this. 3. I picked a zone and stayed until I was done… mostly. I started in Drustvar, and stayed until I finished it. The main reason for starting in Drustvar is that it was suggested as a good place to start if you have mining. Which turned out to be true. My mining got maxed out very quickly indeed, which was great. Another reason I stuck around in the zone was because of how dungeons were baked in to Legion – once you finished a zone, there was a dungeon to help wrap that zone up. It helped make the story feel more complete, and gave a much better context for the dungeons overall. This turned out to be the case for Battle for Azeroth as well, with Waycrest Manor being the dungeon at the end of the zone. Knowing the story that took me there really helps me appreciate the dungeon so much more. I had about a level and a half left to get to 120, and the pressure was on. Stepping in to Stormsong Valley I made the decision to just do the main storyline so the dungeon would make sense. I dinged before I finished the zone, however kept going so that I could unlock world quests. 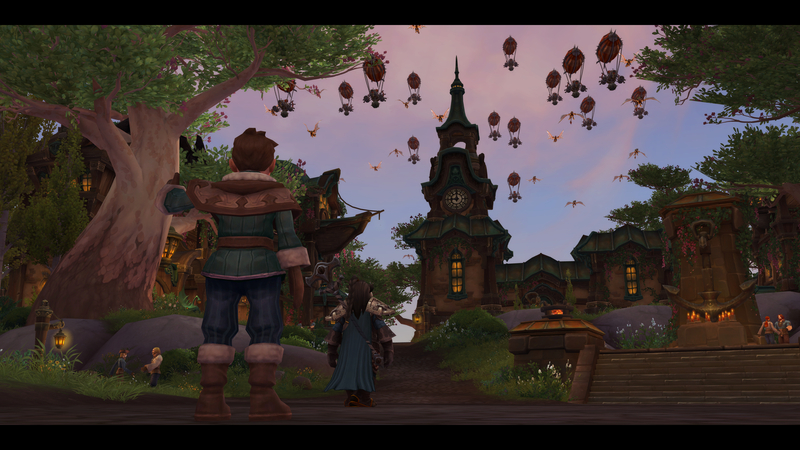 Also, all the zones are STUNNING, so of course I wanted to stay as long as I could!!! After all that, I think it did alright with my levelling journey. I had a wonderful time levelling, I truly did. I am absolutely adoring the expansion, and being able to take my time with it all, to read all the quests and understand what’s going made the whole experience so much better. Now, my focus is on raiding. So I’m running dungeons and doing island expeditions and allllll the world quests to get my reputation up and collect azerite for my neck. I’m honestly having a fabulous time in Battle for Azeroth. I know there are a lot of people out there who are not having the best time, and are unhappy with all the bugs… I’m trying to keep my head down. I don’t want to get weighed down with the negativity. For me, things are great! And the bugs don’t ruin my enjoyment of the game. I’m hoping with a bit of time, peoples’ frustrations will die down.